Robotinos motor-control board EA09 is capable of sending sensor readings and receiving set point values in realtime at a frequency of 1kHz. The EA09 I/O board facilitates the physical connection with Robotino's sensors and motors. The I/O board carries a NXP LPC 2378 micro-controller. The micro-controller's main loop runs at 1kHz. Within this loop the motors' PID controllers are updated. The micro-controller receives, for instance, the set point values at a rate of about 100Hz from the PC104 via a serial link (RS232). 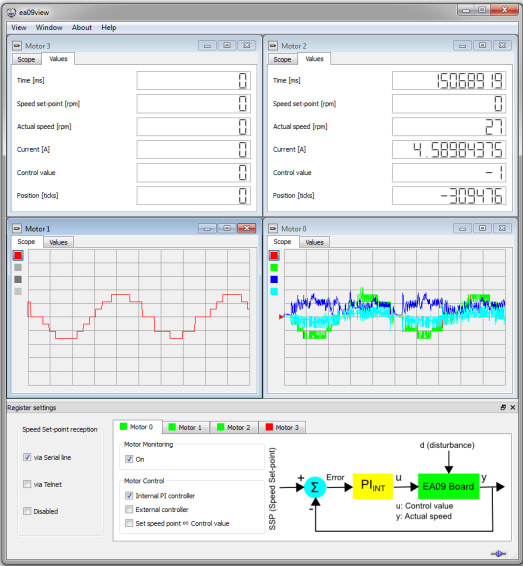 The PID controllers obtain the motors' speed set points (from the PC104) and drive the motors such that the motors' actual velocities equal the speed set points. 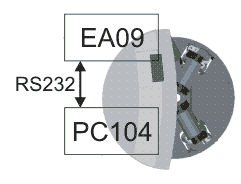 The EA09Com package contains the necessary files required to communicate with the EA09 I/O Board. Download the executable and run the installer to install the package. MATLAB drivers for the EA09 I/O Board can be downloaded and installed. These MATLAB drivers consist of m-files which contain functions to send and receive data from the EA09 I/O Board. Simple to understand examples have also been provided to illustrate the use of the MATLAB functions. or you could also just run the 'startup.m' file in EA09ComMatlab folder to add the directories to MATLAB's search path. An online version of the documentation for EA09ComMatlab can be viewed here. Examples have been provided which illustrate the usage of EA09ComMatlab drivers. They can be viewed here. 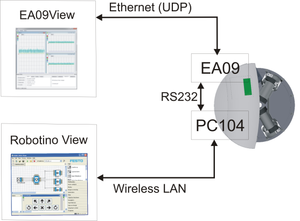 EA09View is a simple tool to monitor and control all aspects of the motors via a direct connection to the EA09 I/O board on Robotino. Download the executable and run the installer. The EA09View connects to the EA09 Board via the Ethernet link. Create a simple program in Robotino® View, for example the one shown below. In the program above, an arbitrary waveform generates a sine wave and the values are fed directly to the motors as Speed Set-points. 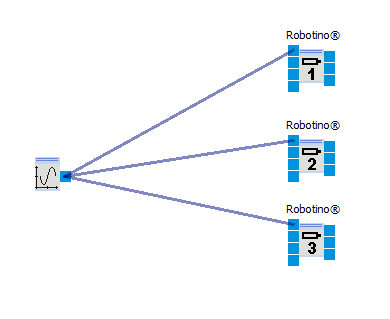 Start the simulation in Robotino® View and you should see an output similar to the one below in EA09View. The Micrcontrollers IP address in Robotino3 is 172.27.254.254. 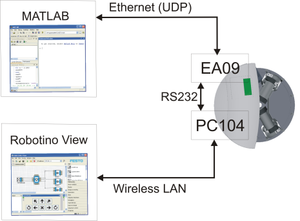 You can connect the Microcontrollers ethernet connector to Robotino's ethernet connector. Than you can use EA09View on Robotino directly. When you are connected to Robotino via WLAN you can not access the subnet 172.27.0.0. To do so you need to forward port 8809 to the Microcontroller. This page was last edited on 27 March 2014, at 12:03.